SAS Survival Guide has long been the definitive guide to surviving any situation, anywhere in the world. Now the big selling book has come to iPhone. The app provides you with the full text of the book along with videos. 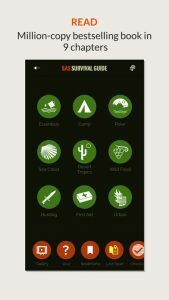 You can download SAS Survival Guide app for $5.99 from iTunes App Store. SAS Survival Guide for iPhone will come handy to get through any outdoor emergency. Written by former SAS soldier and instructor, John “Lofty” Wiseman, this application brings you the elite training techniques of Britain’s toughest fighting force in the most accessible version ever. SAS Survival Guide features the full text of the bestselling book optimised for the iPhone. It includes 16 videos providing invaluable survival tips from Lofty himself. The app also provides information about photo galleries of animal tracks and knots, as well as edible, poisonous, and medicinal plants. You’ll also be provided a brief introduction into snakes and sea creatures that you should avoid. The extreme climate survival part has sections on surviving Polar, Desert, Tropical, and Sea. So how does you know that you had absorbed everything that you might need in the event of an emergency? Try to answer the 100+ question quiz to find out if you have the knowledge to survive a true emergency. If you did not score good, re-read the guide and update your knowledge/skills or survival techniques. The app also got a survival checklist that you should keep ready for yourself before setting out on any adventure or hiking. Further, the app has a Morse code signalling device and a sun compass. The robust search tool let you scan the entire book by subject, in case you wish to jump to any particular section. Also not to miss is the comprehensive first aid section that teaches you about essential first aid procedures. The UI design is user friendly. The app is also stable. SAS Survival Guide requires iOS 8.0+. SAS Survival Guide for iPhone is stuffed with useful tips that will help you to survive in tricky and hostile situations. The book’s author himself provides important survival tips through videos and detailed description explaining each given situation. The search feature let you quickly search for any particular tip or topic. The survival quiz helps you to self-assess your knowledge in survival techniques, while the detailed first aid section comes handy if someone receives an injury. To sum it up, a must have survival guide to have in your back pockets before you set out on any adventurous trip.